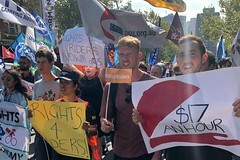 Food delivery riders have marched in Sydney to demand UberEats, Deliveroo and Foodora provide pay increases and better working conditions to the many contractors darting from door to door around Australian cities. Food delivery service Foodora fired one of its cyclists for refusing to hand over control of an encrypted chat group that its workers were using to talk about pay and conditions. Bicycle deliverers for UberEats, Foodora and Deliveroo have said they are paid as little as $6 an hour and called for better conditions and government regulation. 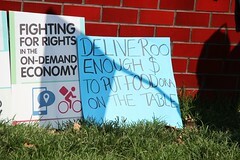 Two foodora cyclists have launched unfair dismissal claims in cases the Transport Workers Union believes could prove a test case for the burgeoning food delivery industry. Do You Care How Much the Person Delivering Your Dinner Gets Paid? Being a fan of the gig economy doesn’t mean we have to abandon workers’ basic rights. That’s why I support #Rights4Riders, Tanya Plibersek writes.